Wood turner Fred Hill of Camptown works out of a home wood shop at the rear of his property. He admits that he often has many projects in progress simultaneously and enjoys the luxury of time to finish them as he pleases. Fred Hill of Camptown is no stranger to discipline. As a professor of biology at Bloomsburg University, Hill drummed into his students’ heads for 28 years the concepts of origin, structure, and behavior of living things. Earlier in life, his father, Clifford, took up woodworking as a hobby and excelled at creating intricate, fully-functional pieces of furniture. In the years that followed his retirement from teaching in 2003, Hill divested himself of the rigidness that had defined his career and, in turn, embraced whimsy and peculiarity as he forged his own path as a woodworker. 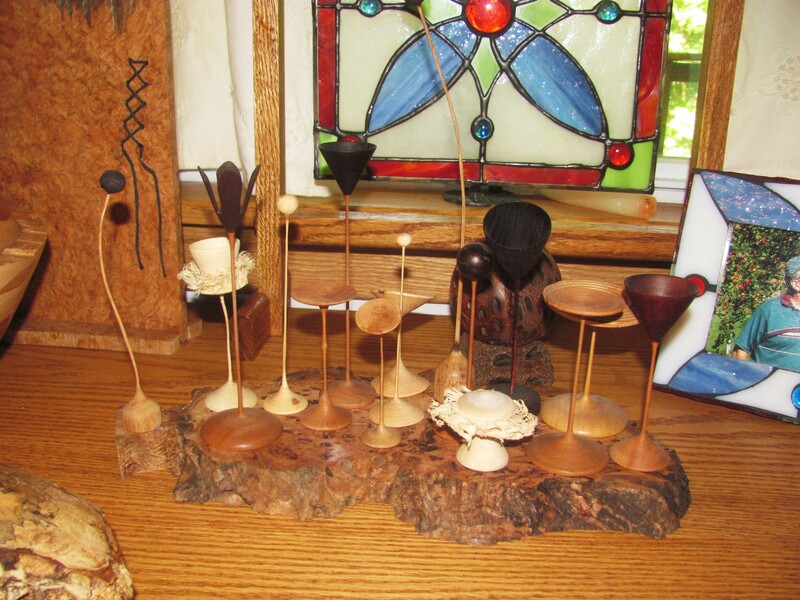 “I like odd juxtapositions of things,” Hill explains as he points to a piece of drift wood upon which wooden spheres of varying sizes and colors seemingly float. That particular piece was inspired by a television program about interstellar gas that he watched while recovering from eye surgery. Setting his mind free allowed him to break with the rules of woodworking and also to apply his skills in nontraditional arenas. Being retired also affords Hill the time to experiment and fail. 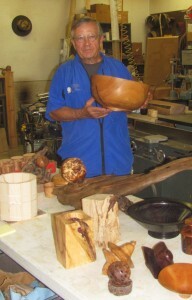 Like many woodworkers, Hill utilizes a variety of hardwoods. But it’s the unusual pieces that he selects for his projects and what he crafts from them that sets Hill’s objets d’art apart from those of his contemporaries. Crosscut sections of trunks and knotty burls from trees riddled by disease, weathered fence posts and barn boards, and the remnants of a cherry tree struck by lightening litter his studio, as do partly completed pieces that he casts aside but often revisits. He sandblasts half-rotted logs and finds meaning and purpose in the resulting shapes. Hill’s wife, Val, is an award-winning quilter and has a studio inside their rural Bradford County home. Ever at Val’s side at quilting shows across the nation, Hill challenged himself to create some products that would appeal to the primarily female attendees of such events. His first invention was a pin holder with a magnet embedded in the bottom that kept pins from bouncing out. Next came his biggest seller to date – the bobbin caddy – a three-inch tall cylinder with six bored grooves to hold bobbins of thread, along with a detachable lid that keeps them from falling out. After introducing them at a quilt show in the Midwest, several quilters asked if they could link to Hill’s website, www.fredhillwoodworking.com, to their own. He was immediately inundated with orders. Hill’s playful ingenuity led to the unique remedy of applying wooden “Bandaids” and cloth stitches to pieces that not only saved them from the burn barrel but led to the repaired pieces being among the most popular items he takes to shows. Hill finds inspiration for his pieces on his 32-acre homestead and in the course of traveling the world. Almost all of the wood he uses comes from his own property, and he has already planted nearly 2,000 trees – far more than he has cut down. 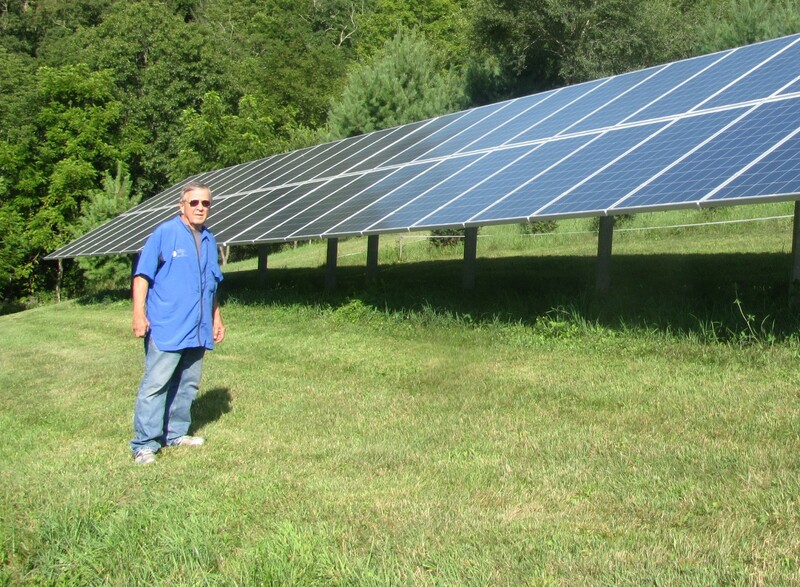 Approximately three years ago, Hill sought to further reduce the footprint of his hobby on the earth by installing 44 solar panels on a knoll north of his house. The 777-square foot solar farm generates more electricity than the Hills can use for most of the year. It was a relatively simple feat of engineering that Hill highly recommends to his friends and neighbors. “As the technology advances, the costs of the panels are dropping about 20 percent per year,” he noted, adding that there are federal subsidies available to assist in the construction of solar farms. Despite optical problems that have temporarily robbed Hill of his depth perception, the master wood turner enjoys sharing his craft with as many as 12 students per year at his home studio. He is quick to tell him them how far he has come in his 30 years as a woodworker and that he is far from finished in developing his skills and products. Hill generates electricity for his wood shop and his home with a field full of solar panels. He has also planted nearly 2,000 trees on his property.